On my first night combat mission in Vietnam (C-130, fall 1967), there were several 130s attempting to find a dark little airfield in Vietnam’s Central Highlands. It’s an area of valleys, hills and mountains, as rugged as West Virginia. This was the darkest night I’d ever seen – no moon, no ground lights – so we couldn’t see any terrain features. go home for our overdue evening cocktail. We Air Force Trash Haulers were real clear about priorities. Except for one guy that night. If you’ve read Tom Wolfe’s The Right Stuff, you know how important it is to a military aviator to be calm and collected. Especially on the radio, to not tip your hand regarding your true state of mind, and to not waste time on the single UHF channel we all shared. There’s even a name for it – radio discipline (Actual Korean war transmission: “Shut up and die like an aviator!”). In other words, this guy was in the same boat as the rest of us. But the stridency of his transmissions was striking, annoying and distracting. I remember thinking that his reaction was way out of proportion to the threat. It seemed that the guy was outraged at the thought that someone was trying to kill him. 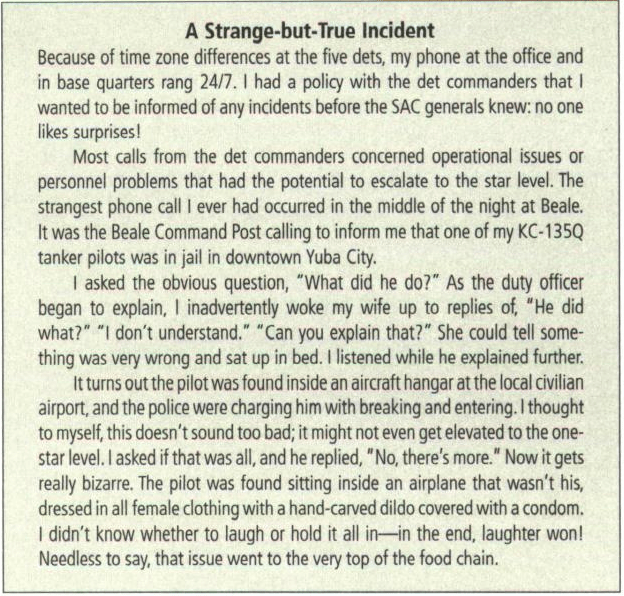 Even though I was new on the job, it seemed an absurd way for a combat pilot to react. Howie pulled up abruptly and we were thankful as usual for the C-130’s amazing performance. Eventually we found the field and got rid of our load. We were able to avoid the hills and the AA on takeoff leg and went home to the stag bar to apply our favorite eraser to the blackboard of life. Earlier, while maneuvering to land, we had turned down the squadron frequency to so we could talk to the tower. By the time we got back in the air, the chatter was totally different. The stressed-out calls were gone, but in addition, the tone of the regular radio calls had changed – the channel seemed subdued. Not enough to comment on – just strange. When we got back to Cam Ranh Bay, we learned that our alarmed comrade had flown into a large mountain avoiding small bullets. The D.C. sniper has an entire region hunkered down. What are the odds any single person in the area will be shot? What are the odds that anyone you know will be affected? What are the odds that the Nightly News will tell you anything of real use? What are the odds that, if you quiet your mind and attend to the work in front of you – or maybe blog a little – you’ll come up with something of surprising value, or do something nice for someone you care about? Our brain – specifically the reticular formation (so-called “reptile brain”) is set up to face threats first and only seek opportunities when not threatened. That bias for threat info sells stuff to us. To that end, the media has grabbed and holds our attention, robbing us of the chance to pay attention to something other than the media. The coverage has next to zero content relevant to personal safety. Our obsession with every imaginable “threat” to our person has overwhelmed our ability to maintain our personal compass in the life we really live in. We forget that we’re all going to die sometime. But we’re wired this way, so there’s little chance we can talk our way out of this silliness, but we may be rescued by technology’s steady march from broadcasting to narrowcasting. Broadcasters (a few sources casting broadly) must compete with each other for attention and ad revenue. Narrowcasters (many sources, beaming their message only to the few who tune in) report in a more human voice, uncluttered by inflated threat messages. The odds are that we’ll avoid the mountains and the bullets. Wandered into your “narrowcast” and read broad meaning. “Way cool, dude!” I’d say if I were of an age to use that vernacular. I will return.